N-Methyldiethanolamine, also known as methyldiethanolamine, or MDEA, is an organic chemical that is majorly used for amine gas treatment or gas sweetening. It is a pale yellow liquid, sometimes also available in a colorless form. The product is available in the liquid form at room temperature with ammonical odor and is miscible with water, alcohol, and benzene. Methyldiethanolamine is produced by ethoxylation of methylamine using ethylene oxide or by hydroxymethylation of diethanolamine, followed by hydrogenolysis. N-Methyldiethanolamine is not a majorly consumed product of the amine group; however, the demand for N-Methyldiethanolamine is high in specific applications. N-Methyldiethanolamine is primarily consumed for syngas and natural gas production and gas treating applications in the oil & gas industry. N-Methyldiethanolamine is a majorly used amine for gas treating applications due to its low vapor pressure, which allows for high amine compositions without appreciable losses through the absorber and regenerator. N-Methyldiethanolamine is employed as an intermediate in the synthesis of numerous products. Its unique chemistry has led to its application in multiple areas including coatings, textile lubricants, polishes, detergents, pesticides, and personal care products. The product is observed to have low toxicity. It does not cause any major side-effect in humans; however, prolonged exposure has been observed to cause serious irritation to the eyes and skin. In industrial settings, N-Methyldiethanolamine is manufactured and handled primarily in closed processes, which limit its exposure. N-Methyldiethanolamine has been listed on the following regulatory agencies; AICS, IECSC, ECHA, EPA, and NFPA. Currently, not many side-effects or toxic effects of N-Methyldiethanolamine have been listed; however, it is likely to be restricted or banned in the future, if any negative health issues are detected. Based on concentration, the N-Methyldiethanolamine market has been segmented into MDEA 95%, MDEA 97%, MDEA 99%, and others (concentration of MDEA below 95%). MDEA 99% is the purest form of MDEA available in the market. Increasing applications of N-Methyldiethanolamine is boosting its demand significantly, across the globe. Demand for N-Methyldiethanolamine is observed to decrease across the industries as the concentration of N-Methyldiethanolamine decreases. Pure MDEA is more effective and efficient. The oil industry witnesses a demand for the purest form of MDEA for the gas treating process. Only the purest MDEA can remove H2S and CO2 during such gas treating process. N-Methyldiethanolamine is commonly utilized in refineries, petrochemical plants, natural gas processing plants, and other industries. MDEA 99% is also employed in the food & beverage industry for the removal of CO2. Demand for MDEA 99% is rising at a higher CAGR, as compared to other concentrations of MDEA. Based on end-use industry, the market can be segregated into oil & gas, paints & coatings, textile, medical, and others. The oil industry segment accounted for a prominent share of the global N-Methyldiethanolamine market in 2016, followed by the textile segment. N-Methyldiethanolamine is a commonly utilized as a solvent for treating gases in order to remove H2S and CO2. The process is commonly known as the gas sweetening process, as the odor of the processed product is improved by the absence of hydrogen sulfide. The amine gas treating process is commonly employed in refineries, petrochemical plants, the food & beverage industry, and natural gas processing plants. Expansion of the gas treating segment across the globe is projected to increase the demand of MDEA across the globe. In the textile industry, N-Methyldiethanolamine is used as a textile softener. MDEA is commonly utilized as an active substance in fabric softeners and is a good alternative to the TEA esterquats. Industries such as textile, paints, and medical have witnessed expansion due to the rapid growth in the economies of major countries across the globe. Rise in population and improved standard of living has led to the rise in demand for textile, paints, and medical products. In the paints industry, MDEA can be utilized in the cationic modification of acrylic polymer dispersions. 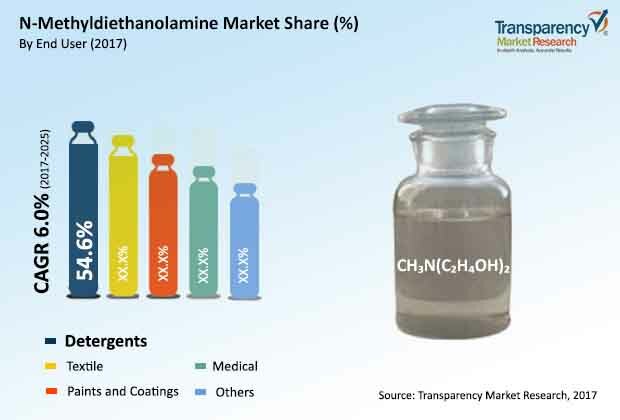 The others segment accounted for a minor share of the global N-Methyldiethanolamine market, which consists of industries such as personal care, water treatment, and agrochemicals. Asia Pacific is a prominent region of the global N-Methyldiethanolamine market. It held a major share of the global market in 2016. The market in Asia Pacific is anticipated to expand at a rapid pace during the forecast period due to the rise in demand for N-Methyldiethanolamine in various applications in the region. China and India are major importers of MDEA across the globe. Expansion of industries such as paints & coatings, textiles, and oil & gas in Asia Pacific is a major reason for the high demand of MDEA. In Europe, the market is estimated to expand at a sluggish pace during the forecast period owing to the presence of developed countries such as Italy, the U.K., and Spain, and a mature market. The U.S. is a leading consumer of N-Methyldiethanolamine across the globe. The N-Methyldiethanolamine market in the country is experiencing a huge demand due to expansion of the oil & gas industry. Middle East & Africa and Latin America held a minor share of the global N-Methyldiethanolamine market in 2016. The market in these regions is estimated to expand at a sluggish pace during the forecast period. Key competitors operating in the global N-Methyldiethanolamine market include Eastman Chemical Company, The Dow Chemical Company, BASF SE, and Amines & Plasticizers Ltd.